Ram Board Plus is the latest floor and hard surface protection on offer from Ram Board. It offers the same impact, water, and general protection as Ram Board, but now features an adhesive strip to allow for extremely quick installation. Ideal for floors, walls, countertops, and any other surface difficult to tape down, Ram Board Plus brings added versatility to the floor protection line. New Ram Board Plus is offered in the same dimensions as standard Ram Board, 38″ x 100′. We’re very interested to begin getting feedback from local builders about the new product. 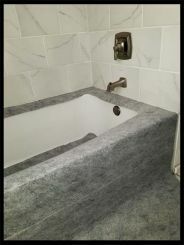 So far a local builder I spoke with was interested in using Ram Board Plus to quickly cover his countertops, as previously it was difficult to tape down standard Ram Board to non-floor surfaces. Visit our website to learn more about Ram Board Plus. DoorGuard Plus is our latest surface protection offering. 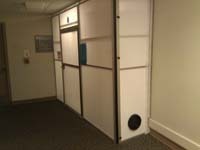 It is designed to protect the larger and wider doors commonly found in hospitals, universities, and other commercial oriented spaces. It attaches to doors using the same patented elastic straps as our standard DoorGuard. Visit our website to learn more. Edge ProTecct is a thick and impact resistant temporary surface protection designed for large edges and mullions. At 4″ wide, these protectors cover the most damage prone area of window mullions or provide additional edge protection for walls or door jambs. Reusable and recyclable. 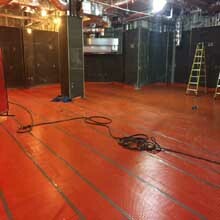 Tuf-Guard floor protection is a breathable low-cost concrete and floor protection product. Tuf-Guard floor protection (superior grade) is a breathable temporary surface protection for hard floors and surfaces, including concrete. There are two types of Tuf-Guard manufactured-this is the professional, superior grade rather than the economy grade. It is the LOWEST COST PER SQ FT of any breatheable, textile style floor protection that we offer. Tuf-Guard is available in 40″ x 325′ rolls covering 1,083 sqft. Tuf-Guard is REUSABLE, and is made of synthetic material so it won’t wear down with continuous use. More information and purchase information at Tuf-guard floor protection. 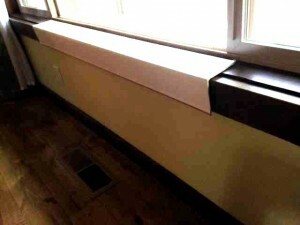 New Ram Jamb fits a variety of jamb widths and is reusable as well as a green product. 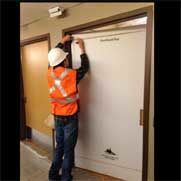 Although there are a variety of door jamb protectors on the market, most are specifically sized to fit common jambs with identical casings. On many commercial projects and custom homes, jambs are more variably sized. The ram jamb adjusts easily from standard jambs up to jambs 11 inches wide. There really is a difference when choosing a floor protection product made from compressed cardboard and Ram Board is the leader for a reason. Although there are lesser priced competitors on the market now, they do not have the functionality and design of the leader in the market. This video shows why the original Ram Board product is still the best. Click here to find out more. Builders Site Protection is now a supplier for EZ Cover concrete protection! EZ Cover is a durable surface protection cover that can be used on virtually any cured concrete slab requiring protection. It is natural-colored cellulose and designed to protect colored or grey concrete slabs. It can be used to cover other types of flooring material during the construction process. Check out www.buildsitepro.com to learn more. This product was also featured on The Surface Protection Experts‘ home page blog! The Jimmer is a great new HVAC protection product that allows HVAC systems to run during construction or remodeling without air flow. It is a pre-taped, breathable bag that fits over most vent openings and interior building surfaces. It is easily applied and removed and prevents debris from entering living spaces. Highly recommended for remodeling and HVAC contractors! The ZipRail™ Dual Seal is a great new product that lets you create a dust-tight seal along the entire floor and ceiling without tape. Used with your existing ZipWall® barrier system, the new ZipRail™ accessory usesZipWall’s patented twist-locking spring loaded pole and two 4′ Foam Rail crossbars mounted top and bottom to push the plastic sheeting tight to the ceiling and the floor. The ZipRail Dual Seal is the fast and easy way to get the best performance from your ZipWall® barrier system.